The dawn of our digital age has a marked influence on the twilight of “family game night”. The installation of broadband internet has brought with it a greater persistance of web-based social interaction and networking that it makes traditional get-togethers rather boring by comparison. We’ve got Steam, Xbox Live, the Playstation Network. This places hundreds of games, thousands of matches and millions of people at your keyboard. Meanwhile, managing to convene with 6 or so of your friends and family to sit down, apart from all those Ethernet shenanigans is becoming trickier to accomplish. But the board game is not dead. This I can assure you. I’ve played them and I have seen the light. Before we get into these new games, allow me to illustrate the problem with older, “classic” games. Quick! Name 3 board games off the top of your head! Now, chances are if you’re a patron of THIS site, you’ve probably named some of the games I’m going to talk about. But try asking my parents several months ago. The list would’ve probably contained titles such as “Clue” (or Cluedo), Monopoly, and Scrabble. 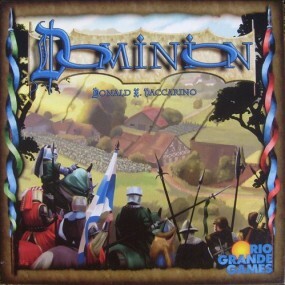 While these are classic examples of what board games USED to be like, the past decade has seen an evolution in the intricacy of gameplay and atmospheres these games create. For instance, your more historical family board game choices would be games such as “Parcheesi” or “Sorry”. While entertaining, the engine of these games boils down to the single victory condition of getting your pieces to the end, rolling the dice, ad infinitum. This doesn’t necessarily detract from their entertainment value, but it does limit the variety that these games provide. After several playthroughs, players have figured out the system and all that’s left to do is to let the dice play the game. The outcome of the game is hardly determined by the actual players. 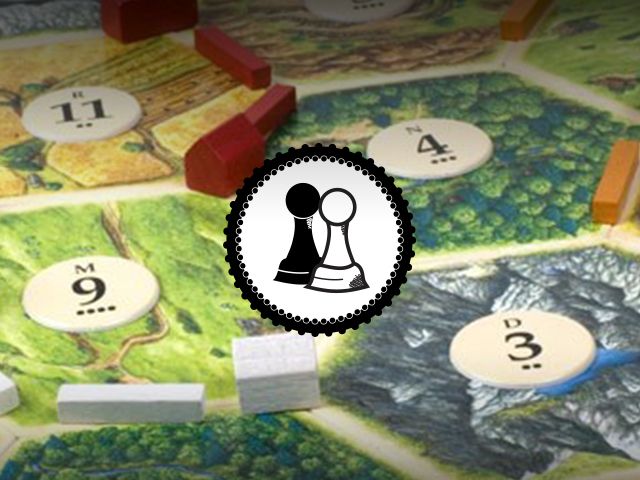 Now, allow me to introduce you to a game that’s largely consider a “new classic”: The Settlers of Catan. For some of you, this may not be considered a “new game” by any stretch of the imagination. The game itself debuted in Germany in 1995. But for a majority of Americans, this game has only recently soared in popularity. 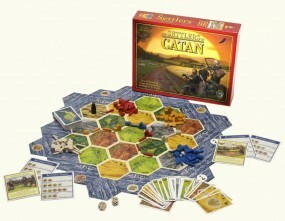 The game has players acting as settlers (as you could glean from its title), collecting and trading resource cards and using them to establishing towns and roads on this island (Catan). The basic goal of the game is this: Be the first player to collect 10 “Victory Points”. However, the means through which one goes about collecting these points are decided by the player. Having the longest, unbroken road on the island is worth points. Meanwhile, establishing more settlements or upgrading existing ones is also worth points. The main engine through which players perform these actions are through collecting, and, more importantly trading cards with other players. This is where the game comes into its own. By enabling and encouraging players to trade, it opens up a very human element wherein players form unwritten alliances and question each others motives. No longer is the game about whether “so-and-so” rolls doubles, but more about whether you’ve maintained diplomatic relationships with the other players. By the way, the board can and often should be randomized to really change up the experience. 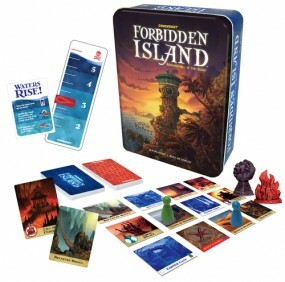 The next game I wanted to mention is Forbidden Island. This is unlike many games you may have played in your childhood: It’s collaborative. That’s right, it’s you and 3 of your friends versus the game. Everyone has the same goal, and everyone simultaneously wins or loses. To add to this, at the beginning of the game players are randomized a “class” or type of character they play as. This gives each player unique abilities in game that they must use in conjunction if they want to win, especially on higher difficulties. There’s not a six-sided die in sight and player interaction is high. Discussing strategy and viable moves is highly encouraged, and the game is engineered that you can have many close calls with defeat. It’s certainly a blast to play. Lastly, I wanted to bring up a different genre of tabletop game that you may or may not be familiar with. Deck-building. What is deck-building? The engine of the game type is pretty novel: all players start out with a basic stock of cards, around 10, and with these, they purchase additional cards from a large pool of cards, each with different abilities and uses. Every time a player runs out of cards to draw, their discarded cards are reshuffled and are reused as their deck. So what starts as a paltry 10 cards, can easily build up to 20-40 cards. This has players figuring out draw statistics of not only their decks, but also the decks of their opponents. Again, the game can be highly social as you can actively undermine your friends victory efforts. Also, since you can choose what types of cards populate the pool that players can purchase, each match can be drastically different than the last. So maybe I’ve made a compelling argument to go out and pick one of these fine games up. If so, you’ll be pleased to know that you can find the games I’ve mentioned at almost any big name bookstore. And if I’ve piqued your interest and you want to learn more, there’s still plenty more to talk about, and I’ll certainly be talking. Till then, play continues to the player on my left.